Online research led to my recent purchase of this military-inspired pair from White House Black Market last week. Though not necessarily a total steal, this $98-pair was a surprisingly much more affordable find at a retailer that, as its name suggests, typically sells items that come in black and white. 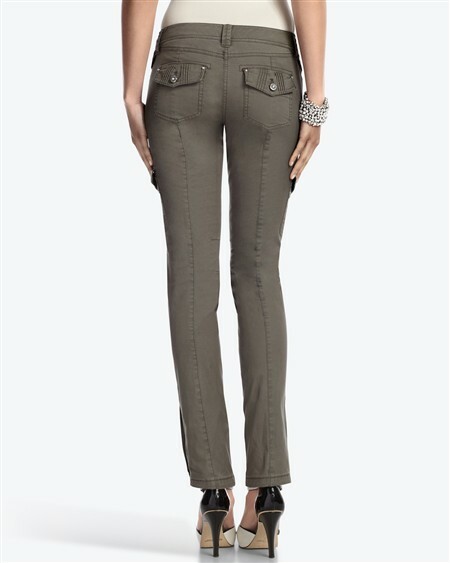 With six pockets, pin-tuck pleat details, and crystal rivets, the Glam Cargo is utilitarian with a touch of bling. Dress them up with a pair of high heel booties or go casual and comfy with ballet flats. The skinny cargo trend won’t be around forever, but it’s a great summer into fall alternative to your basic jeans-and-tee uniform. Yay, something new! I love skinny jeans but unfortunately so does everyone else. I do like this look, but I’m afraid I might be too curvy for it. Hi Chasa! I was getting bored of my skinny jeans too. I’ve actually seen plenty of curvy gals sporting this trend lately. I think the key to making it appear flattering is finding a silhouette on top that’s opposite in shape (i.e. a loose weave cardigan that falls below the backside or a lengthy tee). Your legs will still look long and lean, but you can feel comfortable with a little more coverage. Fun new trend. At what age is it inappropriate to do the skinny? I don’t think there’s a specific cut-off age for rocking the skinny. It’s definitely more about lifestyle, attitude and body type. Knowing you (and your artistic profession as a photographer, not to mention how stylish you already are), a skinny cargo would look amazing on you! 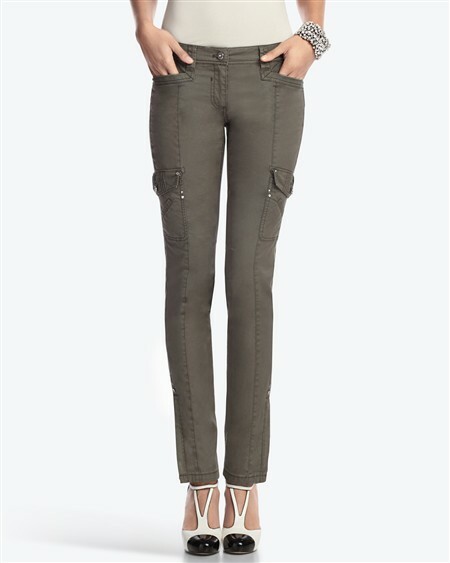 For the mature woman who wants to make sure she’s not showing too much, I’d suggest finding a cargo pant with a normal (not low) rise, and then pairing with a looser, longer top. Balancing proportions is what’s key with this silhouette. And heels over flats will always, of course, make your legs look a mile longer. I can definitely see that working. Thanks for the tip, I’ll have to give it a try! Send me a photo update if you decide to take the skinny plunge. Would love to see what you find and how you style it up. Sometimes I’m wary of combo trends (like sneaker heels and platform flip-flops). But I think this one could win me over.